The celebrated author of Montana 1948 (over 400,000 copies sold) returns to the American West in this riveting tale of familial love and its unexpected consequences. Dalton, North Dakota. It’s September 1951: years since George and Margaret Blackledge lost their son James when he was thrown from a horse; months since his widow Lorna took off with their only grandson and married Donnie Weboy. Margaret is steadfast, resolved to find and retrieve her grandson Jimmy — the one person in this world keeping James’s memory alive — while George, a retired sheriff, is none too eager to stir up trouble. Unable to sway his wife from her mission, George takes to the road with Margaret by his side, traveling through the Dakota badlands to Gladstone, Montana. When Margaret tries to convince Lorna to return home to North Dakota and bring little Jimmy with her, the Blackledges find themselves entangled with the entire Weboy clan, who are determined not to give up the boy without a fight. 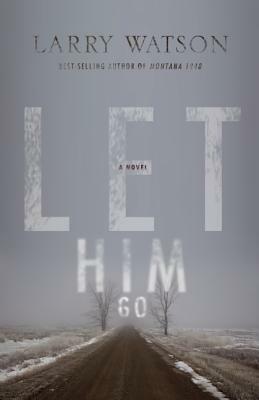 From the author who brought us Montana 1948, Let Him Go is pitch-perfect, gutsy, and unwavering. Larry Watson is at his storytelling finest in this unforgettable return to the American West. Have I been living under a rock? That seems to be the case because this was the first time I've read Larry Watson. What a complete shame. The good thing about discovering a new-to-me author? Backlist! Margaret Blackledge is such an intriguing character. She's fierce. She's stubborn. She's the kind of woman that I'd like to be when I grow up. Let Him Go is startling and rugged. The story is spare without a single wasteful word. The suspense was sensational and the ending was completely unexpected. Lucid prose and fantastic characters made this a compulsively readable novel. If Mr. Watson's other books are as straightforward and precise as Let Him Go I'm in for a treat. I can't wait to add more of his works to my collection. I've never heard of this author, but now I'm so intrigued. I feel like this book could be a bit heart-wrenching. Were there tears involved? Heart-wrenching, yes. Tears, yes! It was so good! So we have to be neighbours under that rock, because it's the first time I see a book of this author. I see you have enjoyed it very much, so it goes straight to my list. I love well developed suspense! I don't think I'll ever be a full fledged adult ;) I kind of refuse to be! Great read, highly recommended! Sounds like a lot is going on in this book, but the fact that you enjoyed it so much says a lot to me. The writing is simply gorgeous. I can't believe I've never read him before! Thank you for the review, and for introducing me to a new-to-me author. I love to find new names to seek out. That is one of the best things about reading blogs :) New authors to discover! Montana 1948 is a fabulous read. I'm definitely going to be looking for that one! It's not you! I've never heard of him either. This sounds like a great story, though. I have never heard of the author but you make it sound like something I need to read and I love that cover. Thanks for sharing! It's such a beautiful story. I hope this book gets a lot of attention! Oh, I completely agree! This was my first Larry Watson book, too. Very spare writing, and an amazing knack of painting characters perfectly with just a few sentences. Did it remind you at all of Kent Haruf, but a bit more brutal? It sure did for me, but I'm not sure how much of that has to do with the characterizations and how much is part of those high plains scenes. This isn't a time period or place I'm necessarily drawn to, but the premise does sound interesting. I haven't read anything from him either, but Milkweed is one of those great small presses that seems to be consistently putting out great book, so I bet that this is great! You are right about that! I'm definitely going to have to explore their catalog a bit more! Let Him Go sounds great. Isn't that wonderful to find a new fav author? I totally want to read his stuff now - I LOVE SPARE WRITING, especially when it manages to pull itself off beautifully. And hahaha yeah, it's so exciting to find a "new" established author and just gorge oneself on all the previous titles. Teehee! Enjoy!!! PS - Did you get this as a physical book or an e-book? Because my experience with Milkweed (so far) has been a physical book and oh.my.word was that one LOVELY LOVELY book to hold. The pages felt good, the cover was beautiful, just everything. YES to spare writing! Sometimes that it just what I want. If it's done well (and this was) it is so gorgeous! I absolutely must read this book! Thanks for your review! Never heard of him! Glad you brought him to my attention. Man I hope this book gets some love from the community. It deserves it! Just added it to my to-read on Goodreads. Great review! Thanks. Hooray! I hope you're able to get to it soon Kristin. It's fab! I guess we've been living in similar circumstances (under rocks). I recognize the title Montana 1948 but can't say I paid attention to the author. Will have to give him a go! It's funny. Since I reviewed this one I've run into two things. Either the person hasn't heard of this author or they HAVE and the LOVE his books. Hmmm. I've never even heard of this guy before! I am definitely going to check it out, though, because any book that you rave this much about HAS to be good! I'm surprised by how many of us had never heard of this author. It's a shame! With that much enthusiasm, how can I NOT check out this book? My first exposure to Watson, too. Let Him Go was a very good modern Western. Loved how the main characters exchanged motivation. I'll read him again. Keep the good reviews coming.